He earned a degree in 1991 at the Conservatory in Como guided by M° Ben Omar. He won first prize with the Naqquara group at the young musicians’ international competition of Stresa and also at the national percussionists’ competition of Bovino (Fg). He partecipated in many pop music tours. 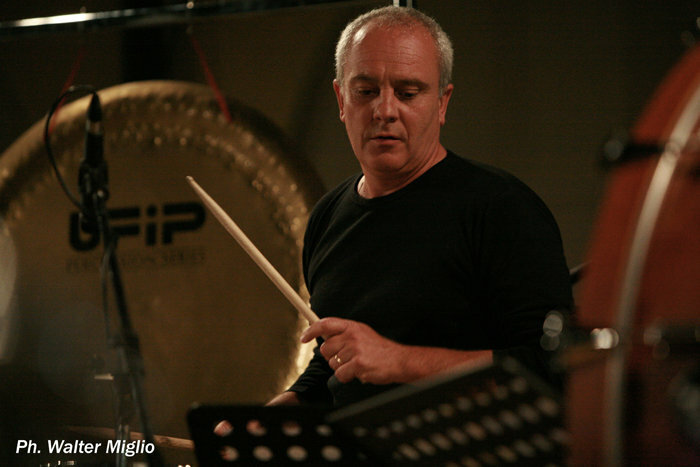 He also appeared in several TV programs, because he was the first drummer with the RAI orchestra of Milan and he played with them for many years. In the past few years, his love for jazz music had precedence over all other kinds of music. Because of this passion, he also partecipated in important festivals such as Clusone, Rocella Bologna, Ivrea, Lugano, Ascona, Le Mans, Berlino, Amburgo, Parigi, Dresda, in collaboration with artists such as, Steve Potts, Gunter Sommer, Paula West Daniel Mille, John Stowell, Rob Sudduth, Bill Ramsey, Dan Barret, Renato Sellani, Gianni Basso Paolo Tomelleri, Laura Fedele, EmilioSoana, Ettore Righello, Lino Patruno, Carlo Bagnoli, Marco Gotti, Sandro Gibellini, Emanuele Cisi.